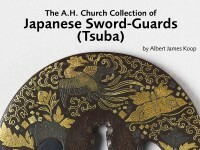 What may be termed the “modern” type of Japanese sword, the type, that is to say, provided with an interchangeable discoid guard, persisted with practically no essential change from about the 8th century A.D. down to recent times. 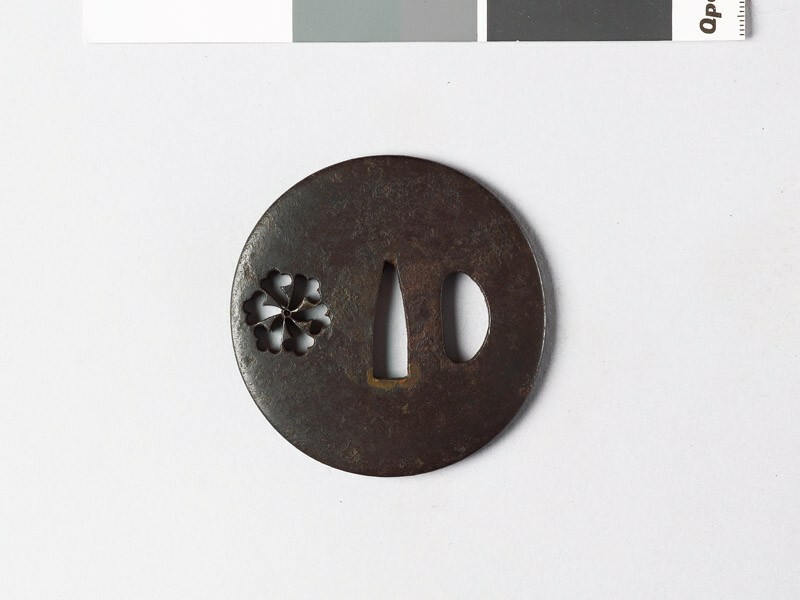 The earliest guards made for it appear from literary evidence (there are no extant examples) to have made of lacquered leather (neri-tsuba), often rimmed with metal for strength. 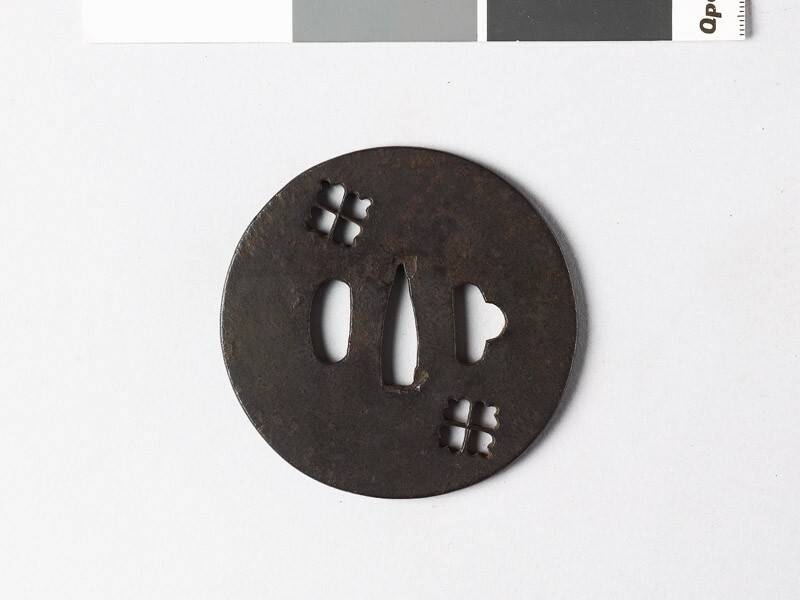 The all-iron guard (ita-tsuba) came in probably during the 12th century, being at first made by the swordsmith himself to fit the blade supplied by him. 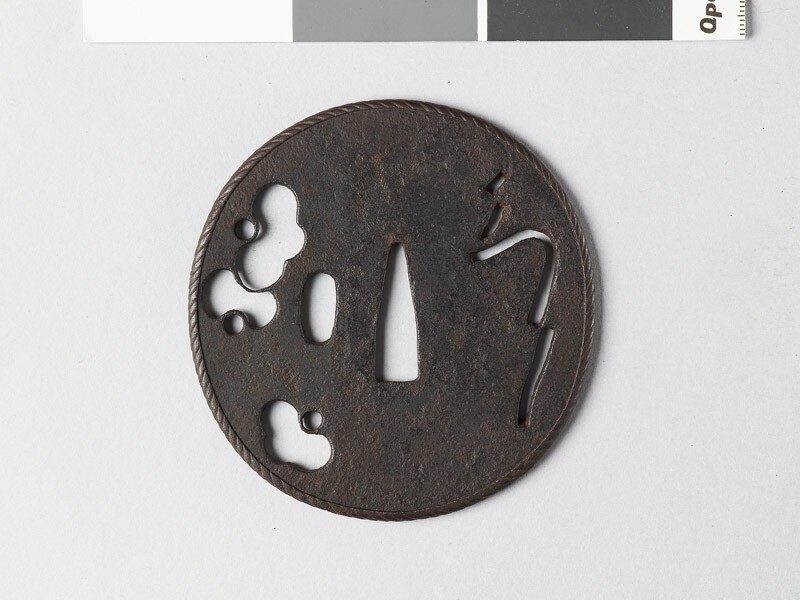 Usually circular, it was comparatively thin, of even thickness throughout, and often provided with a few piercings either as decoration in negative silhouette or merely to adjust the balance of the blade (or perhaps for both reasons). 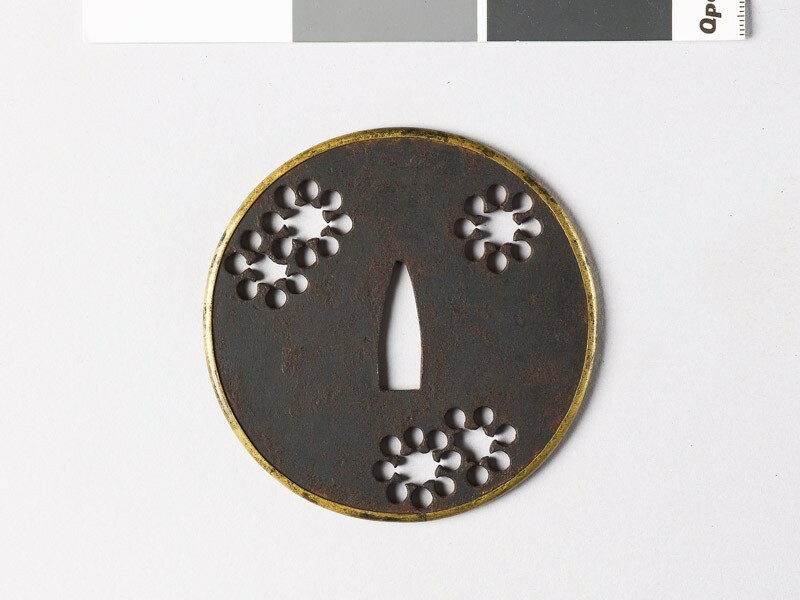 Later the armourers, and especially the important Miōchin family (see Group IV), took to the making of tsuba as a side-line, and the types generally described as “Early Armourers’ Guards” are also for the most part circular and provided with piercings, but have a comparatively thin field with a thickened edge (which is often a marked border of rounded section). In both swordsmiths’ and armourers’ types the surface is left rough as it came from the hammer. These sequence-numbers (in each case preceded by the number "0-" are those adopted by the Ashmolean Museum, Oxford, to which the collection was bequeathed by Sir Arthur Church. They will be found painted on the guards, in all but a few instances inside the tang-hole. The number following each description is that adopted by Sir Arthur in his manuscript catalogue, and has in most cases been painted by him either on the upper edge of the guard, or on the seppadai (front or back indifferently), or, as from about No.1260 (Church) [EAX.10402] onwards, inside the tang-hole. Where it has been found impossible to identify a few of the guards not so marked, the reference "(No no.)" is entered here.